The larger of Samsung's two svelte tablets, the 5.6mm thin Samsung Galaxy Tab S2 9.7, is coming to U.S. Cellular on September 11th. Customers can put $0 down and pay $27.50 a month over 24 months. That works out to a total cash outlay of $660 USD. The full balance can be paid off at any time. Qualified customers can add the slate to their Shared Connect plan for as low as $10 per month. 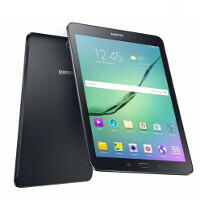 The Samsung Galaxy Tab S2 9.7 features a 9.7-inch Super AMOLED screen carrying a 1536 x 2048 resolution. That works out to a 264ppi pixel density. An Exynos 5433 SoC is under the hood, with a 64-bit octa-core 1.9GHz CPU and the Mali-T760 MP6 GPU. 3GB of RAM is inside along with 32GB/64GB of internal memory, and a 128GB capacity microSD slot. A 5870mAh battery keeps the generator humming, and Android 5.0 is pre-installed. The slate also features a fingerprint scanner. This is the version of the tablet that features support for 4G LTE-A Cat. 6, with speeds as fast as 300Mbps. There is also a Wi-Fi only version which is not being offered by the nation's fifth largest carrier. Touchwiz looking good on that 4:3 aspect ratio. Sadly, this was meant as a direct iPad competitor. Last year's Galaxy Tab S gave potential to this line and feels like it's going gone because of this. They couldn't pick a better release date? Meh, just another bastardized and overpriced toy...although it may have the best display on the market, this is nowhere near worth up to the Surface 3 IMO. The tab pro had a much better display. This one is put to shame by the ipad. It is pixelated. A real disappointed. See one in person before you comment. My bad, I presumed it'll be no less than the predecessor, Samsung Galaxy Tab S, and that by far had one of the best displays, better than an iPad...from the looks of the specs (bit.ly/1i4DxQ7), yeah it's a downgrade in the resolution (bit.ly/1i4DmUY), exactly the same as the iPad Air 2 (bit.ly/1i4Dgww), but still a better display technology (Super AMOLED) with infinite contrast ratio. Svelte in the third dimension, but unnecessarily fat in the second, with the bezels and the 4:3 ratio. Sorry Google and Samsung, but please give me a reason why you both ditched 16:9 (16:10) and opted for 4:3, aside from trying to catch some eyeballs from iPad owners. Android seriously doesn't look good at all on 4:3, especially since Google decided to remove both Tablet UI (since 4.4) and dual notification panels (since 5.0).